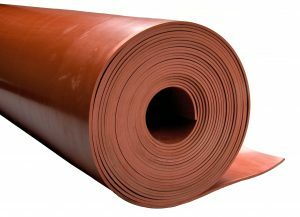 Polyurethane sheet is a versatile high-performance elastomer that is highly customizeable in a range of colors, sizes, and hardnesses (durometers). Polyurethane provides abrasion and puncture resistance, and is compatible with many solvents, oils, and chemicals. It also has high resilience and a higher load bearing capacity than most synthetic rubber materials. Polyurethane sheet is typically poured into square sheets or profiles. The sheet can then be stamped into custom seals including shapes and gaskets with bolt holes. (the photo shown as a roll is a similar product but made from another elastomer). Polyurethane is a poured material typically supplied in flat sheets or slabs. Standard sizes available are 12, 24, 36, or 48 inch squares sheets. Other widths and lengths available in select styles or by special order.